A cute close up vertical picture taken of an apricot goldendoodle puppy dog sitting. This puppy is about 10 weeks old. 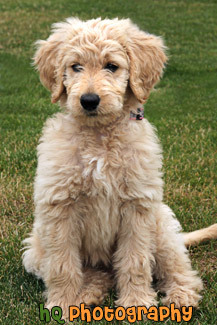 A goldendoodle is a cross between a golden retriever and a standard poodle.